In these notes I have had to keep the instructions to the simpler areas of the subject. Reed adjustment is a complex multi-dimensional discipline which has to take many factors into account simultaneously. Most players eventually get some training from their teachers. The basic activities are tip-cutting and scraping. To do these you will need a sturdy craft knife, a specialist oboe reed scraping knife and an oboe reed plaque (to support the reed). However there are a few things you can try with little or no equipment and I try to describe some of these below. First - soak the reed in water for 2 -3 minutes. 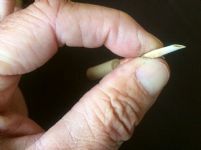 Remember that as you adjust it the reed may gradually dry out, so regularly re-soak it in the water for a minute or so. Second - blow the reed on it's own a few times, then put it in the oboe and play various notes from low to high. While doing this think about how responsive it is (how easily it blows), and also about it's tone (the quality of the sound). Slightly unresponsive - this will make the reed feel "stuffy" - notes don't start easily, and the tone is dull. Sometimes the reed can be squeezed more closed - first soak the reed for a minute in hot tap water then gently squeeze the reed blades at the wired part, squeezing front and back so that the tip opening closes slightly. Warning! - if you squeeze to much in one go you may split the reed so go carefully, a little change at a time, testing the reed between each squeeze. Often this is not the solution, in which case the reed will probably need scraping to thin the cane. Scraping should only be attempted if you have the correct equipment and training. Your teacher may be able to do this. Very unresponsive - this will make the reed feel either very hard to blow, or impossible to get a note to play. Usually scraping the reed is the only solution and this should be done by an experienced player. Slightly too responsive - the reed will feel a little too "alive" with a slightly resonant or "pinging" quality to the sound, and it will blow too easily with too little resistance for stable comfortable playing. Try soaking the reed in hot tap water for a minute then squeeze the reed at the wired part from side to side such that the tip opening gets wider. Warning! - it is easy to split the reed while doing this so go carefully opening the reed a little at a time, testing it each time to see how it improves. If this doesn't improve the response enough you will need to cut a tiny sliver off the tip of the reed - usually between 0.1 and 0.2 mm. This is best done by someone who has experience and training. Far too responsive - the solution is the same as above but it will be necessary to cut a larger amount off the tip. It is best to cut small amount off the tip at a time, testing the reed each time so you don't cut too much off. Often when this has been done the reed may need a slight re-scrape to balance it, and this will require the correct equipment and training. Once response is adjusted to your preference, think about the tone quality - is it ok, or too bright or too dull. Too Bright - assuming the response is about right, this usually means the heart of the reed is too thin compared to the sides. The solution is to scrape the sides only to thin them - scraping just the outer 1mm edges of each cane between the back of the scrape and the tip (but not scraping the tip). Too dull - assuming the response is about right, this usually means the heart area is too thick compared to the sides, in which case scraping the heart gently (using diagonal scrapes to retain the humped shape of the heart) will thin this area and brighten the tone. Test the reed regularly to avoid over-scraping. If you have other reed adjustment issues you would like to discuss please contact us.